The bodies of youth in Asia are burning in acts of protest. What is the message? Not just whatever slogan bystanders may have heard them articulate, but what message is being spoken in this act as an event? What do these acts signify? What might they produce? And what is required of us in order to truly listen? For in an era when messages are instantaneously, voicelessly transmitted, there is a kind of learning and listening that must be acquired, in order to apprehend the spirit and significance of this message. On March 17, 21-year-old Tibetan monk Lobsang Phuntsok set fire to himself outside Kirti monastery, located in Ngaba county in China’s Sichuan province. His act was followed by a monk from nearby Kardze Monastery self-immolating and subsequently dying in August, as well as a string of self-immolations in the past month, where six Tibetan monks age 17 to 19 ­— again of Kirti Monastery — have set fire to themselves. All were arrested before dying, according to Tibetan exile sources, and two later died. The whereabouts and conditions of the other four are unknown. Phuntsok’s actions set off a month-long siege of Kirti monks and Tibetan residents of Ngaba by Chinese forces, where phone lines were cut off and tourists were banned as residents and monks engaged in massive peaceful protests. According to an assessment by Human Rights Watch cited in the New York Times last week, 300 monks were reportedly sent to “re-education through labor” camps as a result of their standoff with authorities ­— there are 2,000 fewer monks at Kirti now, compared to the total number in March, a disappearance attributed to similar detention camps. 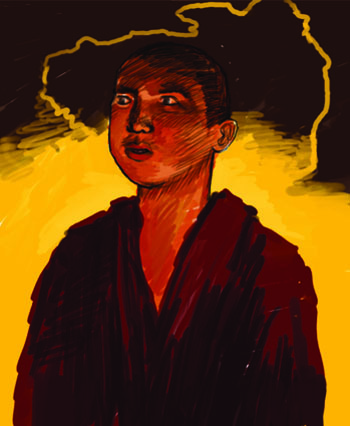 Although self-immolating may be a recent, relatively unprecedented phenomena among Tibetans, monastic or otherwise, it takes place against a long history of protest and resistance to colonialism. While it is not possible to pin the origins of self-immolation as protest on a religious or cultural disposition, that it arises out of an unbearable circumstance of political and social injustice is unmistakable. The self-immolation of Thich Quang Duc during the Vietnam War in protest of the treatment of Buddhists under South Vietnam’s Diem regime (widely supported by the U.S. for its anti-communist stance) caused several other monks to follow his example and is seen as marking the turning point of the crisis faced by Vietnamese Buddhists that led to the toppling of the regime. In December 2010, Tunisian street vendor Mohamed Bouazizi’s self-immolation became a catalyst for revolution, setting off demonstrations across the country. I cannot guess at what these acts in Tibet might bring about. Unlike the example of Tunisia, Tibetans are viewed as a minority “other” in China, and so it seems unlikely that political acts by them would influence political actions among the Han Chinese majority, as they arise out of a particular set of conditions. However, Tibetans are not the only source of minority unrest in China. The Uighur population has been protesting for decades, the 2009 Urumqi protests receiving widespread media attention in China and elsewhere. If we listen closely, we can hear what is being whispered in this message, even if we do not yet know its effects — the voices of all those suffering under oppression, seeking freedom from those enemies known as intolerance, fanaticism, hatred and discrimination. As we listen to this particular act of witnessing by young Tibetans, we can rise to the challenge of making sense of an action that is, at its heart, anything but senseless. I recall the historic letter in which Thich Nhat Hanh reached out to a member of another oppressed people, African-American reverend and activist Martin Luther King, Jr. In it, Thich responds to the question, “Why does he have to burn himself to death?” by refining our perception of the action from a position of seeing only a destructive end to one that turns its gaze back upon the movement itself. In so doing, we may arrive at a deeper understanding of what is being generated by these acts. Tenzin Mingyur Paldron is a Ph.D. student in the department of rhetoric at UC Berkeley. very interesting to read!!! at first, i thought, well, another article on self-immolation but after i started reading, i couldnt stop. the article is very informative and insightful. It makes you understand the hidden meanings of all these actions. not just the facts..